"First Graders Offended By School News Article!" Last month, I shared a post (here) written by first grade teacher, Renee McAnulty from Hesperia, California. Her candid description of the challenges she faced with her class at the beginning of the school year generated TONS of questions, comments, and emails from teachers with similar classroom situations and experiences. I'm excited to share this second post by Mrs. McAnulty about the "unexpected consequences" of having taught the Secrets to her first grade class! The day started just as any day would. My happy, joyful, busy, and near-the-end-of-the-school-year kids were getting ready for Daily 5. They grabbed their Daily 5 folders, bookmarks, and went to pull out their book bags... but wait…they had no books!!! Being the end of the year, we had to return them back to the library. Great. Well, if there is one thing I have learned in my years of teaching, it's that great teachers improvise. So I calmed my panicked babies and told them I had something incredibly special for them to read during "Read to Self" and "Read to Someone" and that they were going to flip out. So they began high-fiving each other and shouting cheers of joy and celebration while I frantically searched around the classroom for something, anything, that they could read... they didn't know that I was winging it... there had to be something they could read that was still in the classroom. Then I spotted it, shining down from the heavens above… a stack of hot-off-the-press school newspapers. “The Howler! It's perfect," I thought. "They can read this. They will love it!" So I gasped loudly so my students sensed my excitement. I told them I had the most wonderful thing in the entire world that they would be able to read… their very own, big kid SCHOOL NEWSPAPER! “Boys and girls, because of SECRET STORIES, you now know how to read big kid things. This is a perfect opportunity for you to use your newly found super powers and read this paper.” One would have thought that I passed out ice cream at that moment. The kids started screaming and yelling with excitement, anxious to read this mysterious, and previously 'intimidating', big-kid newspaper. 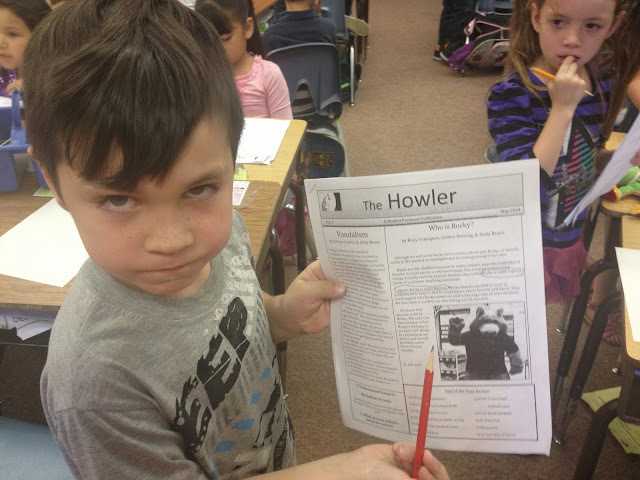 I started passing them out and the kids got even more excited because pictured on the front of the newspaper was a picture of our beloved school mascot, Rocky the Coyote. 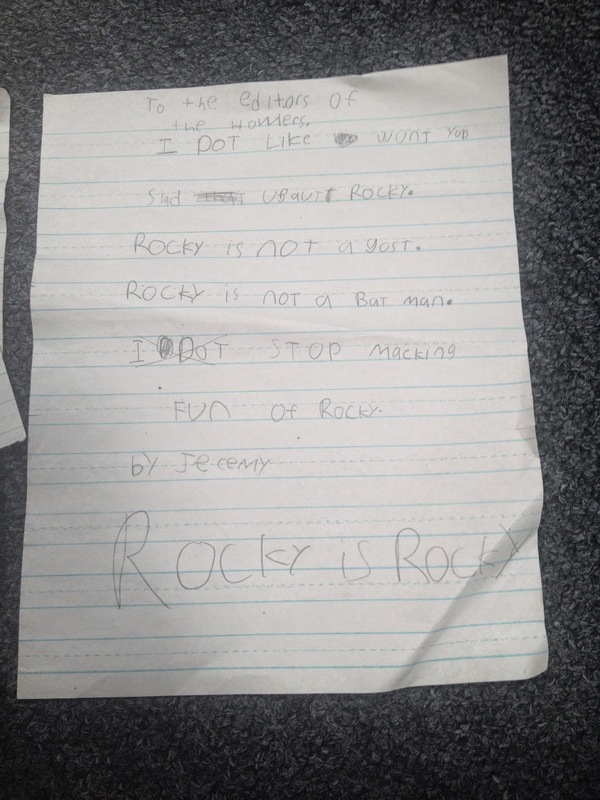 “I can’t wait to read about Rocky," some of my students shrieked. And I’m thinking to myself, "I'm amazing! I can't believe I thought of this on such a whim. 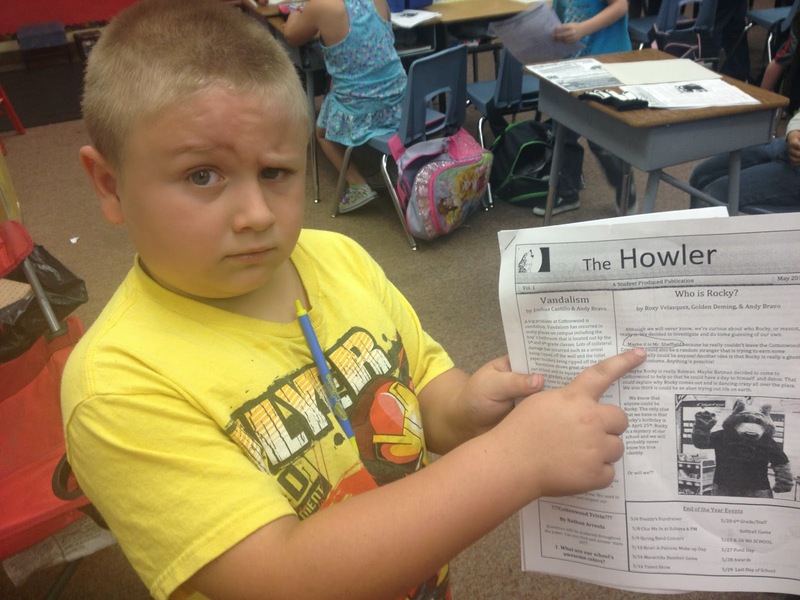 And I can’t believe my first graders can read an actual newspaper! What could possibly go wrong?" At this point. I am so high on my cloud and nothing could bring me down… or at least I thought. I turned my kids loose for Daily 5 and they knew exactly what to do. I watched in awe as my sweet babies were traveling to “Word Working” centers, “Work on Writing” centers and “Listening Centers”. I watched with tears of happiness as my “Read to Selves” are grabbing their Nooks and pulling up their texts INDEPENDENTLY and reading right away. When I glanced over to the “Read to Someone” group, the had their newspapers clenched tightly in their sweet, little fingers. The excitement is radiating through their faces as they read their newspaper. I can hear the others say, ”Oh, I cant wait until "Read to Someone" so I can read my newspaper”. This is a teacher’s dream. We had come so far this year, and it's always good to enjoy the fruits of our labor. As the kids worked feverishly, it was time for me to get down to business. I was a 'free' teacher right then, and I was all set to finish up my end of the year DRA's in peace as the kids were happy. Life was perfect. So I sat down at my reading table and called over the first child. Now, my kids know my Golden Rule during Guided Reading and/or DRA’s, and that is, "Unless you are bleeding, or your head has suddenly popped off your body, you do not interrupt me... at all!!" So there I sat, testing away happily thinking how amazing these kids were when I started to hear a small ruckus developing from the "Read to Someone" kids. I thought nothing of it at first, but noticed that group had started to recruit other kids over to their group. I noticed that "Word Workers" and "Read to Selfers" were sneaking back to their desks to retrieve their newspapers, too. I quickly called for order, “Boys and girls! My goodness, this is so sad. Get back to your stations until you hear the chimes. Then you can switch to your next station.” Disappointed, the kids get back to work. They know to not argue when Mrs. Mac is testing. Well, the chimes rang and it was time to rotate. I got a bit suspicious when I noticed how fast the kids were switching to the next rotation. Especially, the "Read to Someone" group. They zoomed to their desks and grabbed their articles and immediately found their partners, which was becoming more of a mini-mob instead of partners, but you pick and choose your battles. They were reading and on task, and I had DRA’s to do. About 7 minutes into this rotation, I started to hear a commotion coming from the "Read to Someone" s again. This time I looked up and saw kids in complete chaos. Kids from all rotations were literally crying and pointing to an article in the newspaper. Kids were consoling and embracing each other. “Don’t worry,” said one of my munchkins, “Mrs. Mac is almost done with this DRA, we'll get to the bottom of this.” Needless to say, they officially had my attention now. I jumped from my seat and raced over to the hysterical kiddos. “Oh, babies, what’s wrong? !” With tears streaming from down their cheek, and anger in their voices, they proceeded to tell me that they were “offended” by this "horrible article". (Exact words) “How can they say such lies about our Rocky?!" another child yelled. “They are nothing but fibbers!” said another. What on earth were they talking about? At that moment, my students grabbed me by the hand and led me to a spot on the carpet. “You better sit down, Mrs Mac, this is awful news.” They started reading, in unison, this article to me. They were crying and emphasizing the parts that were upsetting them. It was the cutest, yet saddest, yet most exciting moment of my career. THEY WERE READING... and reading well, with inflection in their voices. The article was about our school mascot Rocky. He is a lovable coyote who shows up at all of our school's events. 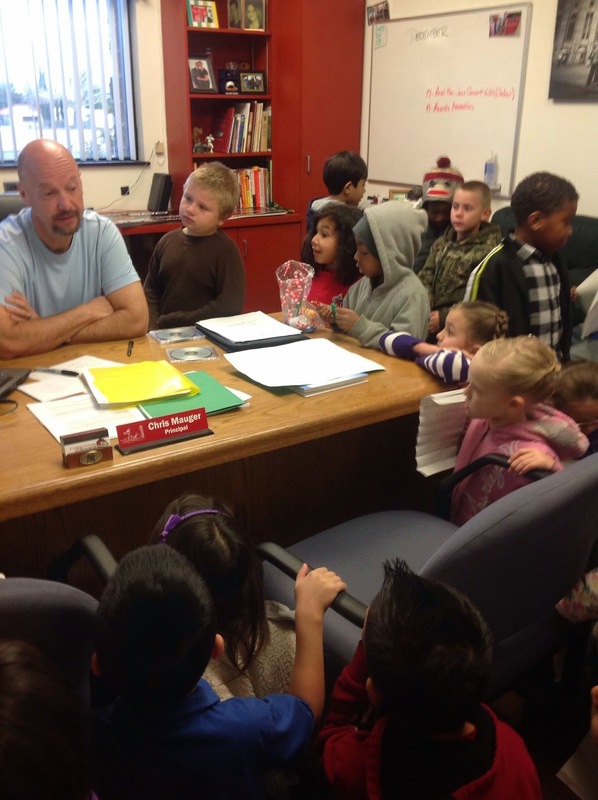 The kids love him and he is a huge part of our school. 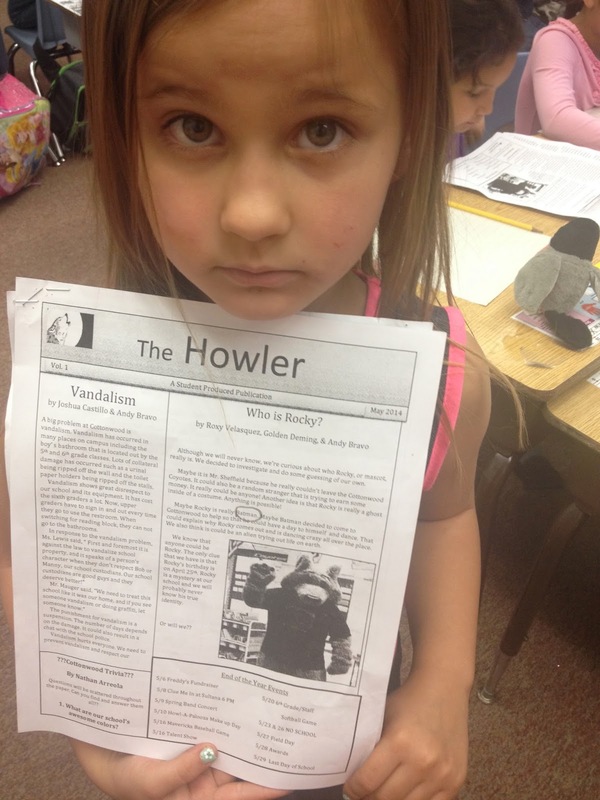 The school news team had written an article, "Who is the REAL Rocky?” insinuating that our mascot was not really a coyote, but a person in a costume! Now, one might think, "Hey, what’s the big deal about that?" But when you are 6 and 7 years old, and have magical elves, gingerbread men, and leprechauns visit your classroom on a regular basis, you see Rocky as Rocky... He's a coyote— our coyote. No ifs, ands, or buts about it. Sure, Rocky can be anywhere from 5’4” to 6'2", but my babies never noticed those details. They just cared that he showed up when they needed him. 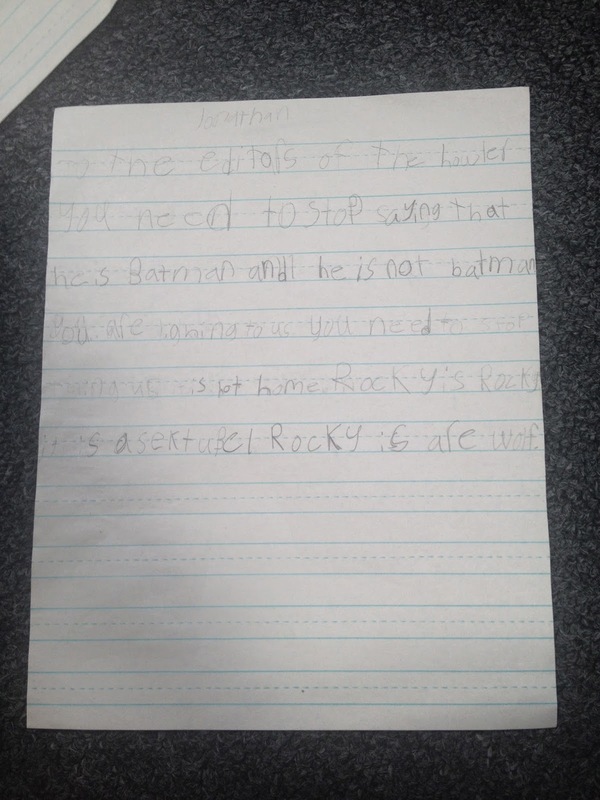 The article made accusations that maybe Rocky was our former Assistant Principal, or even Batman, or a ghost. “We need to bring this to Mr. Mauger (our principal) immediately!" yelled several students. So, we sent over a few representatives to bring this to his attention. Meanwhile, I ended Daily 5 and called the kids back to their seats to have a discussion. They expressed their concerns and how “offended” they were. We then talked about how they could appropriately address this situation, being the highly educated first graders that they were now. 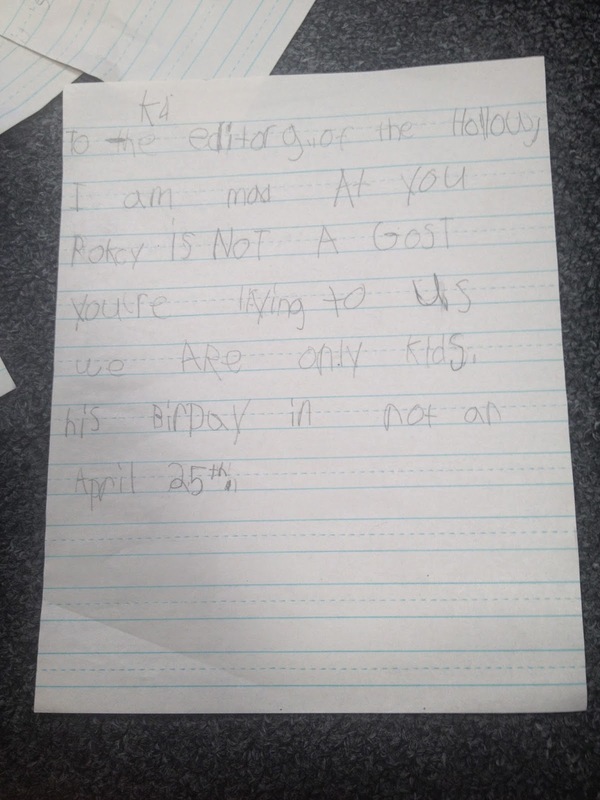 One of the student’s raised their hand, “We can write letters to the editor!” ..... “YES!!! Let’s do that right now!" the kids shouted. 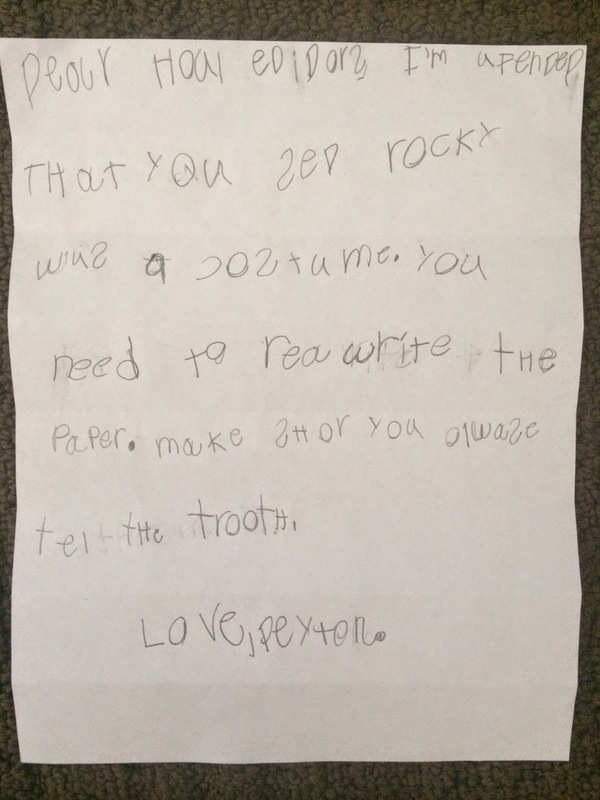 I’m sorry, did my six year olds just ask to write letters to the editor, or was I dreaming? At this point, they had taken over completely. My paper passers took the liberty to pass out papers to each of the students. 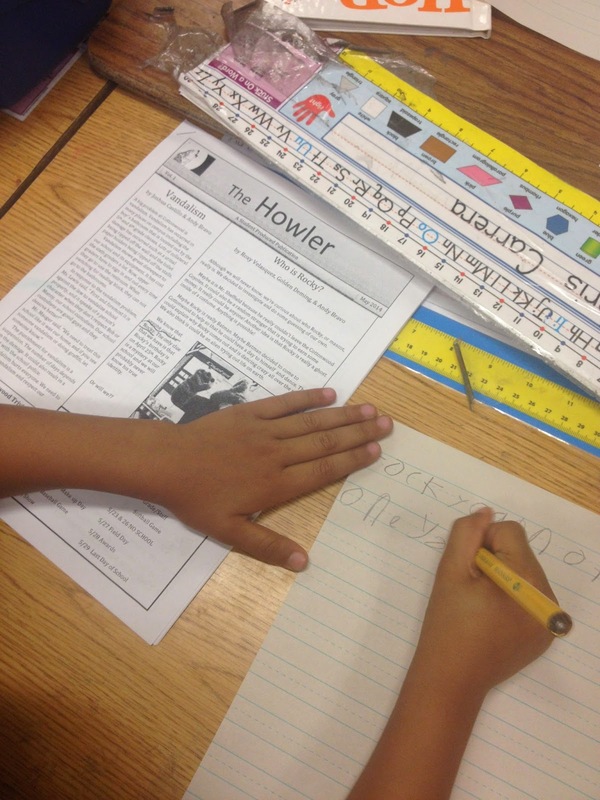 Team leaders started giving directions to underline offending sentences in the article. And I’m just standing there in utter amazement, watching this unfold before my eyes. These same kids could not read the word "the" at the beginning of the year, let alone a sentence. Now they were analyzing a newspaper article and responding to the editor... ON THEIR OWN!! Was this the Twilight Zone? No, I was witnessing the power of SECRET STORIES. Because they now knew how to read, they actually enjoyed reading. They can sit back and focus on the words, and what they mean, rather than trying to figure out "What does this letter say?" and "What is this word?" It was the most beautiful sight I had ever seen. Mr. Mauger and I were fighting to hold back smiles, since this was a very serious matter to them. He calmed them down and explained that the article was an "opinion piece" and that, of course, we all believe that Rocky is Rocky. As their little faces slowly started to smile again, the tears started to dry, and faith was once again regained in our society, Mauger looked at me said, "This is amazing." My response? "I wish I could take credit, but this was all them." This amazingly perfect lesson was never planned, was not in any teacher's manual, and probably will never happen again, as it was driven by learners and their passion to read. I'd done nothing but give them the tools they needed to be successful. They used those tools and in turn, created something amazing that I never in a million years would have never thought possible from a class of 6 and 7 year olds. And that is why SECRET STORIES will always play an important role in my classroom. 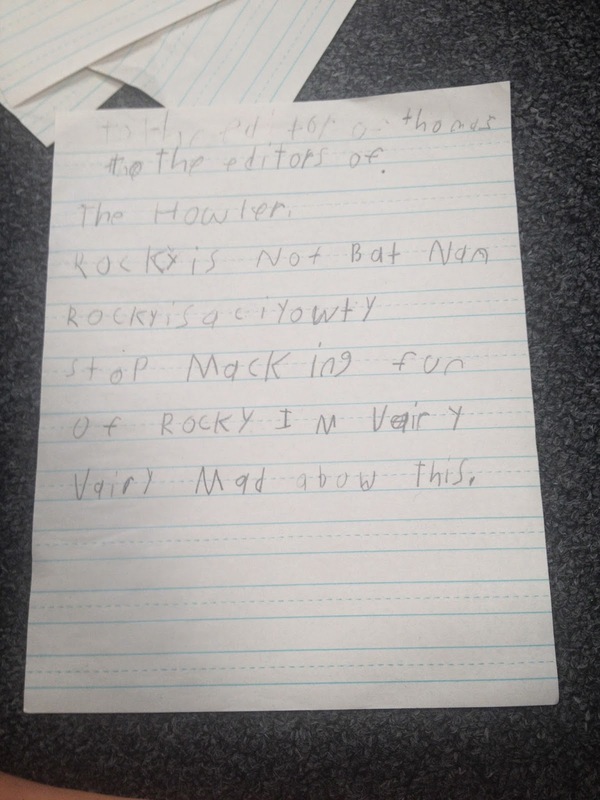 As I'm sure Renee has covered, our first graders were very upset by the implication in our school newspaper that our mascot Rocky is anything other than an actual coyote. The sixth graders who wrote the article about our mascot theorized that perhaps Rocky was a former school employee in a costume. Or maybe a ghost. Naturally, the first graders were appalled and felt the need to express their displeasure by writing letters to the editor. The simple fact that six-year olds would WANT to write in the first place is impressive, let alone view it as an authentic, everyday strategy to make your opinions heard. And did they ever! 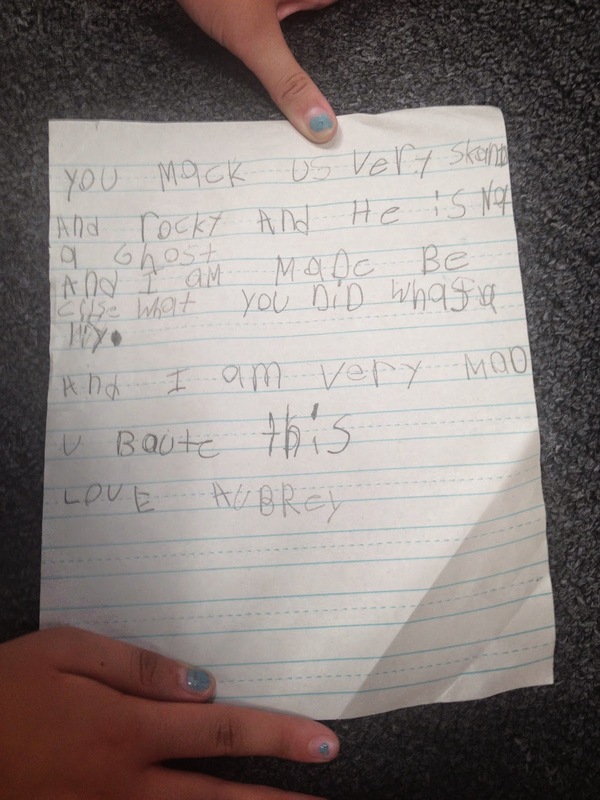 Because of the SECRET STORIES and our first grade teachers' emphasis on applying the stories to writing, the kids' letters were not limited to simple statements like "We are mad." No indeed, our first graders were tossing around words like unacceptable, offended, and apologize, and even if the spelling wasn't perfect, their message rang out loud and clear. 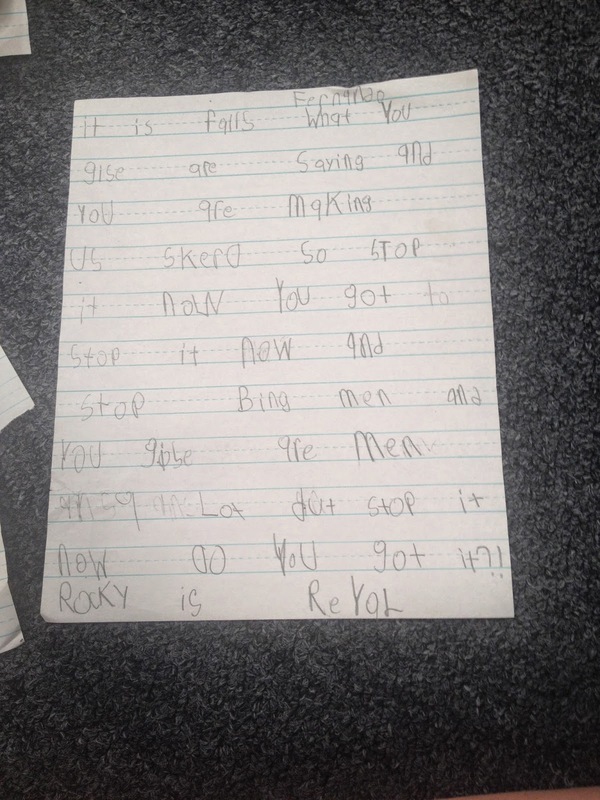 By writing what they wanted to say, without limiting themselves only to words they knew they could spell, our first graders proved that they are well on their way to becoming highly proficient writers down the road. They also have charm and compassion, as evidenced by one little girl who, after writing five sentences of complete disgust and disdain for the slanderous journalists, closed her letter with a simple, "Love, Kaylee." Because it's possible to be really, really mad and someone and still love them. Kind of makes you want to say "aw" .... or is it "au?" Posing with the upsetting article. Just look at that passion on their faces. Students underlining and writing their responses to the article. I hope you enjoyed this little peek into our crazy classroom! This is an adorable post! I would love to use Secret Stories with my first graders! Thank you so much. 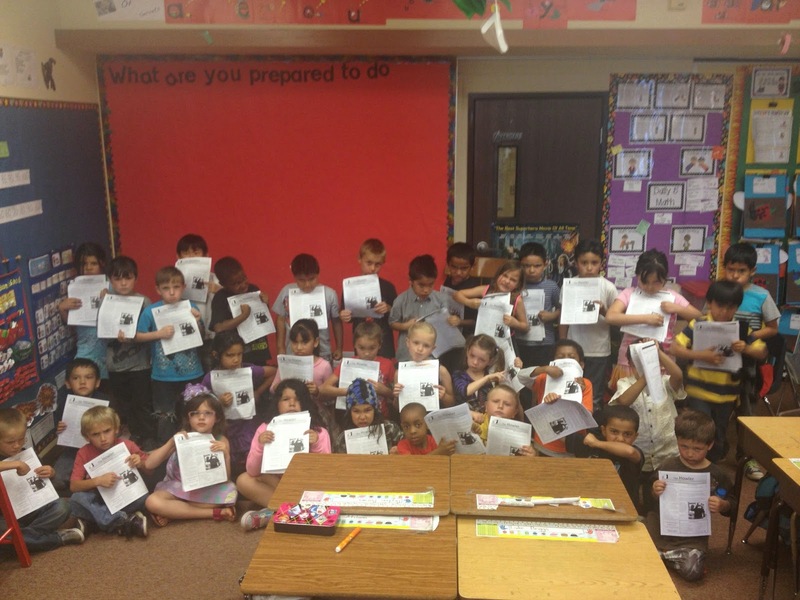 :) This program is perfect for first grade! Indeed, it was a controversial morning in Coyoteland. Great work, Mac! Love it! Sometimes the best lessons are the ones that are not planned. I too am amazed at how quickly my kindergarteners picked up on and used the Secret Stories. They brought me close to tears on the last day when I flipped through the book and they were able to tell me the story for each picture and examples of words that you would find the secret in. Amazing considering we had only learned about the secrets starting after spring break. I can't wait to see what will happen next year when I share them earlier! Isn't it wonderful to see the fruit of your labors. I too can't wait to start the new year with Secret Stories. Wow! I love how you just stood back and watched them learn. That is what a great facilitator can do and Secret Stories. I have only used a couple of the strategies with my class and they love them. Thank you!!! 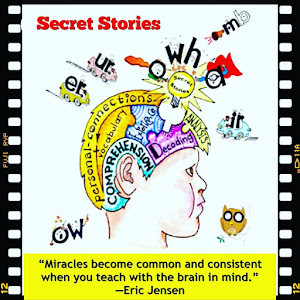 Even though I am a retired teacher, who still loves teaching, thinks Secret Stories is a blessing to reading. Keep up the great work, Mrs. Mac. Thank you…..it is a BLESSING! Such an amazing post that I am sure I will reread a few times :) This would be great to use in my Kindergarten classroom this upcoming year! Thank you for all of your hard work! I have had great success with the Secret Stories in Kinder as well. We only used it for a few months last year after I found this site during Christmas Break. At the end of the year, I had students who, ON THEIR OWN, would want to "make lists" in reading. They would list the secrets, then go find words in books around the room that fit each one. It was really amazing! I can not wait to see my Kinders next year since I will be using it from day one! Love this story! I want to learn more about Secret Stories. Love this idea! Hoping to win the free giveaway in June to use at my high poverty school! This has to be one of my most favorite Secret Stories "stories"! People always underestimate K and first graders and their ability to learn and process information. I especially love the photos of the kids and their faces as they point to the offensive article!! I also have really enjoyed your blog posts. They are so insightful and thought provoking Thanks ! Thank you!!! Their faces are just so animated I had to capture it!!! Their passion was so strong I am so glad I was able to share it with you all!!! Wow! This the first I've heard of Secret Stories and I'm impressed! 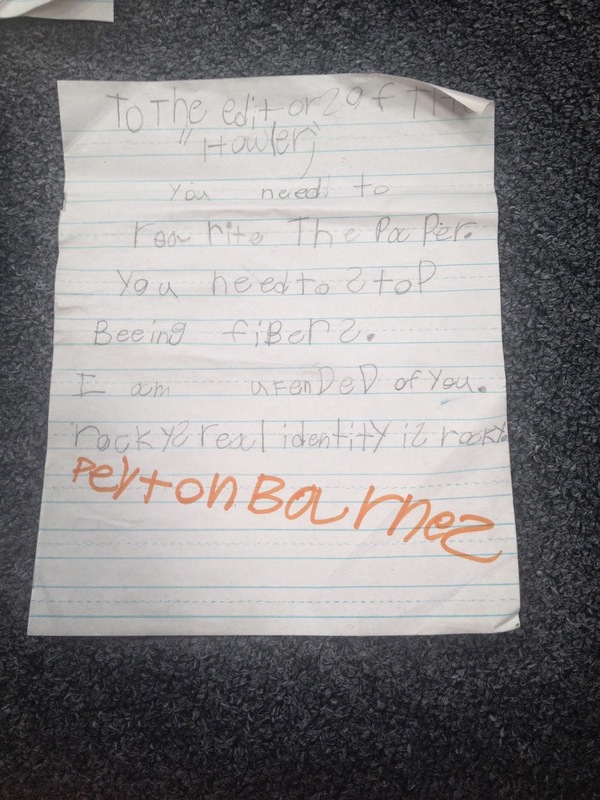 I dug back into your blog a bit to try to figure out what Secret Stories is and love the idea of giving the letters personalities to help the kids make connections. My firsties remember all of my stories about my family so it makes sense that these stories would help them make these important connections. I would love to win this and use it with my kids! This program is amazing!!! The stories is exactly why they work. Good luck!!! I read this on Mrs. Jump's page. I am SOOOO glad that you shared!! I absolutely LOVE teaching, but I have been enjoying the relaxing time of summer. Besides the "research" that I do by reading blogs, I haven't really thought of school. Reading about your kiddos brought tears to my eyes. I could feel their passion for words. But more than that, I could feel your pride in their accomplishments. Thank you for getting me excited for school (instead of wishing the summer would last longer!). I can't wait to follow your blog and the journeys of your new sweeties this fall! You're inspiring!! The comment above is mine. I'm not sure why my ID was just numbers. Tracy, thank you so much. Your comment brought me to tears. I know how hard we work during the school year and when we finally make it to summer, it's such a relief!!!! I can't wait to share more stories with you all this year!! I just read the amazing post on Deanna's blog. I am your newest follower! You are obviously an amazing teacher! Thank you!!!!!!!!! I love my job!!! I am starting my first year of teaching in first grade in August! I LOVE your approach to teaching phonemic awareness and phonics! I really want to try this out. Thanks for all you do and for sharing! First grade is amazing!!! I love every minute of it. Best wishes to you and your babies during your Secret Stories journey. I could not stop smiling through this whole post. That's what teaching is all about!! I would love to start this approach with my Kinders next year. How have I never hear about Secret Stories! This is fabulous!